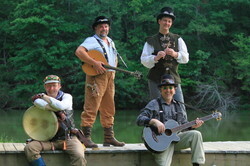 Emerald Rose is a four-man folk rock band in the New Celtic tradition with a rich, original "world fusion" sound with influences ranging from the Chieftains to Jethro Tull. Blending harmony vocals, pennywhistle, Irish pipes, world percussion, driving guitars and bass, their music ranges from traditional jigs and reels to original folk rock and pop numbers. Many of the band's musical themes draw from Celtic myth and legend, but their style is modern, upbeat and accessible. The band has eight CD's released ("Emerald Rose" 1998, "Bending Tradition" 2000, their live CD "Fire In The Head" 2002, "Celtic Crescent" 2003, "Songs for the Night Sky" 2004, "Archives of Ages to Come" 2005, "Con Suite" 2007 and "That Night In The Garden" 2009). Their music has been featured on numerous radio shows across the USA, and on two documentary films: "Ringers: Lord of the Fans" by theOneRing.net and "Done The Impossible" by Brian Wiser. Emerald Rose is known for rousing, high-energy live performances. They have performed to capacity crowds at Atlanta venues such as Dragon*Con, the Variety Playhouse, Eddies Attic and numerous Celtic festivals. Emerald Rose was the headline band at the Oscars cast party for "Lord of the Rings: The Two Towers" in 2003, and again at the Oscars-sweep celebration cast party for "Return of the King" in 2004.